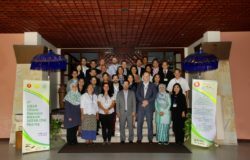 The knowledge exchange on the Use of Climate Information Services in Agriculture between the Republic of Indonesia and Lao People’s Democratic Republic took place from September 6—8, 2016 in Bogor, Indonesia. 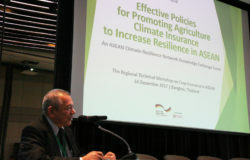 “Supporting farmers to deal with the consequences of climate change has high priority in Indonesia and is crucial to ensure our country’s food security” explains Dr. Dedi Nursyamsi, Director of Indonesian Center for Agricultural Land Resources Research and Development, representing the Indonesian Agency for Agricultural Research and Development (IAARD). Indonesia has made significant progress to do so through the provision of the Integrated Cropping Calendar and Information System (ICCIS), a service that supports farmers in decision making on when to plant their crops and how to ensure a successful harvest. Inputs from technical experts and discussions among the participants highlight that numerous technologies to manage the impacts of climate change on agriculture have been tested and developed in Laos as well as in Indonesia. To make those technologies useful for farmers, they need to be carefully adjusted to the local ecosystem. For farmers to apply climate related advice and technologies on their farms climate and weather predictions need to be accurate and reliable in their local context. Otherwise farmers won’t risk changing their practice and might lose their trust in the support provided. Accurate predictions can only be made were reliable and comprehensive climate data, like historic rainfall and temperature, is available. By processing such data in complex climate and agronomic models, climate forecasts and agronomic advisories are developed. Building a comprehensive database and country wide data collection through the establishment of a network of climate stations therefore is vital and one of the reason for the strength of the forecasts made in Indonesia by the Agency of Meteorology, Climatology and Geophysics (BMKG). But providing reliable climate predictions is not enough to encourage farmers to change their traditional practices. “We need to improve the climate literacy of farmers to help them adapt to climate change. Once they are able to interpret climate predictions and understand how the climate is related to their farm management, they can develop coping strategies. Complex climate information needs to translated into farmers’ practical language”, states Ms. Nelly Florida, Head of the Applied Climate Center in the Indonesian Agency in the BMKG. This is exactly what the Climate Field Schools (CFS), organized by BMKG in close collaboration with the IAARD and local extension agents, do. Their implementation in numerous districts has shown that rice yields can be increased by up to 30%, if climate predictions are better taken into account for rice farm management. The delegation from Laos had the opportunity to take part in a CFS activity during an excursion to Leuwiliang Village in Bogor on the third day of the knowledge exchange. 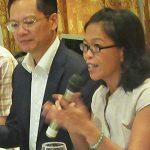 “The information and experience shared by the Indonesian experts is highly relevant for the Lao context. We are looking forward to apply this knowledge in our country and hope that there will be future opportunities to learn from Indonesia”, points out Mr. Viengsavanh Phimphachanhvongsod, Deputy Director in the Lao National Agriculture and Forestry Research Institute (NAFRI). As a first step to translate their learnings into practical activities, participants jointly developed action plans for improving the climate information services for agriculture in their respective countries. The knowledge exchange was facilitated by the ASEAN Climate Resilience Network, based on a request of the Lao Department of Agriculture. Consequently, IAARD, a founding member of the ASEAN-CRN, offered to host the event. Lao delegates from NAFRI, the Department of Agriculture under the Ministry of Agriculture and Forestry as well as from the Department of Disaster Management and Climate Change and the Department of Meteorology and Hydrology, under the Ministry of Natural Resources and Environment attended the event. The ASEAN-CRN is established to ensure that ASEAN Member States are in a better position to adapt their agricultural sector to climate change and optimize its mitigation potential. The network promotes climate resiliency through exchange of information, expertise, and experiences on Climate Smart Agriculture practices amongst ASEAN member states. 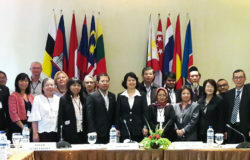 The ASEAN-CRN is supported by the German Federal Ministry for Economic Cooperation and Development (BMZ) through the ASEAN-German Programme on Response to Climate Change in Agriculture and Forestry (GAP-CC). 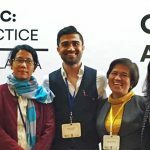 GAP-CC is implemented by the Deutsche Gesellschaft für Internationale Zusammenarbeit (GIZ) GmbH in close cooperation with the ASEAN Secretariat (ASEC). To learn more, visit www.asean-crn.org.